In other words, organically managed soils deal with water better—both in conditions of drought and heavy storms (the frequency of which is also expected to increase as the climate changes). Soil rich in organic matter (well-decayed remnants of plants and other living creatures) bolster soil in weather extremes by helping store water in times of scarcity and by holding together and not eroding away during heavy rains. 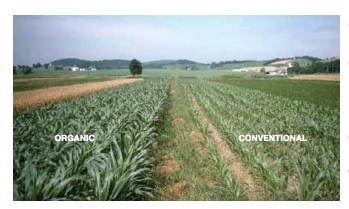 Corn in the [organic] legume-based (left) and conventional (right) plots six weeks after planting during the 1995 drought. The conventional corn is showing signs of water stress. 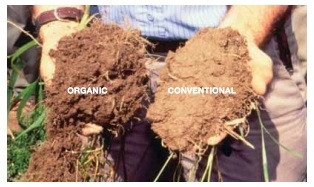 Photo and caption: Rodale InstituteAnd why would organically managed soils contain more organic matter? It quite likely has to do with the ways conventional and organic farmers feed the soil. If you’re a conventional farmer, you probably fertilize annually with synthetic nitrogen fertilizer in the form of anhydrous ammonia. This is isolated plant food, free of any organic matter. (It’s the equivalent of taking a vitamin pill—pure nutrients without actual food.) The only organic matter your soil gets comes from the crop residues that you leave in your field. This brings the advantage of convenience—crop nutrients come from tanks that can efficiently be sprayed on to fields. And it also gives crops a quick jot of ready-to-use nitrogen. If you’re an organic farmer, you don’t have the luxury of blasting your soil with straight nitrogen. To replenish nutrients, you have to have physical stuff that contains nitrogen bound up in organic matter—think compost and manure. You can also grow legume cover crops that trap nitrogen from the air and deliver it to the roots of plants in a form that can be taken into the soil. In this case, too, you’re adding a nice dose of organic matter along with nitrogen, in the form of the plants that rot in the ground when the cover crops does. And, like conventional farmers, you get the benefit of crop residues left in the field. Carbon performs many crucial functions such as acting as a reservoir of plant nutrients, binding soil particles together, maintaining soil temperature, providing a food source for microbes, binding heavy metals and pesticides, influencing water-holding capacity and aeration, and more. Now, this insight doesn’t mean that our food security depends on the farmers who manage the Midwest’s vast corn and soy fields converting to organic immediately, complete with USDA certification. But it does mean that these farmers have something important to learn from organic farming: that feeding the soil means much more than lashing it with isolated nitrogen. It also requires judicious use of manure, much more focus on compost, crop diversification (no more rotations of just corn and soy), and a new dedication to winter-season cover-cropping. Without diving into the wonky depths of agricultural economics, I can say for sure that none of this will happen without a serious nudge from US farm policy. Here is my modest proposal, which will not make it into the once-in-five years farm bill now being debated in Congress, but may look attractive down the road as climate change proceeds apace: Stop using farm policy to prod farmers to grow as much corn, soy, and a few other commodities as possible, as is being done now and for the foreseeable future, and start subsidizing them based on how much carbon they store in their soil. As the Rodale results show, crop yields will take care of themselves as the Midwest’s soils gain organic matter. In short, a climate-ready agriculture system will not likely arrive gift-wrapped in the form of a silver-bullet technology from the ag-biotech industry. Rather, if we achieve it, it will be because we figured out how to convince farmers en masse to use their land to sponge up carbon.